The Lennon Wall or John Lennon Wall is a wall in Prague, Czech Republic. Once a normal wall, since the 1980s it has been filled with John Lennon-inspired graffiti and pieces of lyrics from Beatles' songs. 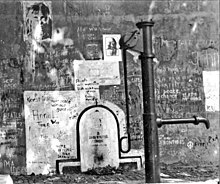 Located in a small and secluded square across from the French Embassy, the wall received its first such decoration following the 1980 assassination of John Lennon when an unknown artist painted a single image of the singer-songwriter and some lyrics. In 1988, the wall was a source of irritation for the communist regime of Gustáv Husák. Young Czechs wrote grievances on the wall and in a report of the time this led to a clash between hundreds of students and security police on the nearby Charles Bridge. The movement these students followed was described as "Lennonism" and Czech authorities described these people variously as alcoholics, mentally deranged, sociopathic, and agents of Western capitalism. A similar wall inspired by the original wall has appeared on the walls of the Hong Kong Central Government Offices, with citizens posting colourful post-it notes with their democratic wishes for Hong Kong during 2014 Hong Kong protests. On 17 November 2014, the 25th anniversary of the Velvet Revolution, the wall was painted over in pure white by a group of art students, leaving only the text "wall is over" [sic]. The Knights of Malta initially filed a criminal complaint for vandalism against the students, which they later retracted after gaining contact with them. The wall mural is still there as of July 23, 2017. And the "Wall is Over" bit has been changed to "War Is Over”, a song. ^ "The John Lennon Wall (Prague, Czech Republic)". Buyoya.com. Retrieved 2018-10-03. 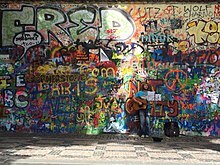 ^ "Prague's Famous John Lennon Wall: Is It Over, or Reborn?". Smithsonian.com. Retrieved 2018-10-03. ^ "John Lennon Wall". lonelyplanet.com. Retrieved 2018-10-03. ^ "Wall Is Over! Lennonovu zeď v Praze přetřeli na bílo" [Wall is Over! Lennon Wall in Prague painted over in white]. Česká televize (in Czech). Retrieved 18 November 2014. Wikimedia Commons has media related to John Lennon Wall, Prague.